The Tower of Abd al-Aziz, better known as The Tower of Abdelaziz (emir established in Seville between the years 714 to 719, until he was murdered by his cousins)is an hexagonal tower, vertex of the city walls. The walls of the Alcázar connected with this tower, towards the street of Santo Tomás, located in the corner with the Constitution Avenue, and from this tower started another wall, following along that Avenue towards the Puerta de Jeréz. Only a few meters away there was an arch, called Arco de la Plata or Arco de la Victoria, also Almohad, culminating the fortress until the Puerta de Jerez, where began the defensive walls. 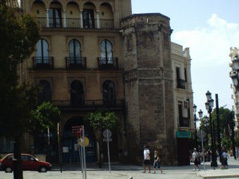 From the Tower of Abd-el-Aziz started a second wall, in the direction of the street Santander, that connected with the Tower of Silver and Postigo del Carbón.